Relationships of waste and people. What we’re really doing is resource recovery of people, we just happen to be using the waste stream. 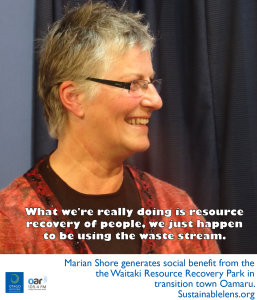 Marion Shore is the energy behind the Waitaki Resource Recovery Park in Oamaru. She is also involved in many community initiatives, including restorative justice and Transition Oamaru and Waitaki District. A workshop I went to by mistake…organics in waste streams…he said the most hazardous material in the waste stream is organic matter – that didn’t make sense to me. I know now that the organics breaks down – but that’s the problem…a chemical soup leachate problem. I thought “that’s really simple, we’ll just change the system”. The most profound thing for me was the potential to create significant social benefit using the waste stream. Mentoring at risk youth, long term unemployed, PACT…creating a social hub. We’re able to create the social benefit for no additional cost to the community. Not having kerbside recovery is actually a good solution, it means that wasters pay, recyclers get benefits. Rather than subsidising people who don’t recycle, the wasters pay and the recyclers get the benefit from either buying responsibly or disposing responsibly. There’s been some serious challenges to our existence over the years, but the community responded – marches to support the park. There was a year that they were changing the waste plan, and we weren’t a part of that, but there were 2000 submissions in favour of us. The primary goal is reuse of recycling, anything in the bins is just stuff we haven’t currently found a recovery pathway for. It’s good to look in the bin. At one stage the majority of what was in the bin was big furniture. So we found a market for foam. So then we dismantled to wood, wire and foam – we could sell all of that. All the time we’re looking at local markets. Because our material is hand sorted we have a much higher quality, and so a broader range of markets are open to us. What is really frustrating is new packaging. You’d think that packaging would have come with a system to manage the other end – but there isn’t. If it’s mixed it’s rubbish, if it’s separated it’s resource. While there’s a lot more awareness, there are other things that are not helpful. We divert about 86% of what comes on site from landfill (but this isn’t the community figure as there is also kerbside rubbish collection). Ideally we’d have systems that would do us out of business – I’d love to be redundant. But we’re treading water. There’s no vetting of packaging, especially in cheap imported goods. Waste crosses boundaries, everyone has it, and intrinsically people want to do the right thing. We’ve created an environment… as we lose social agencies…we’re able to replace that in a way, in the real world. Everyone is just volunteers, treated the same. We’ve been instrumental in turning around persistent offenders – there’s a different way to treat people, a different way to behave and it’s OK.
Restorative justice – an amazing powerful process – often profoundly beneficial. You never know where the trigger is going to to be – what is going to turn the light on. Innovative solutions that don’t necessarily cost – that brings the social aspect in. Most often the offender is also a victim. As a society we need to retrain in how we address conflict. (Motivation?) We’re all part of the one – we’re all interconnected. (Challenge?) Less and less support from central government for social issues. (Miracle?) That we’ve come up with social solutions locally. (Advice?) You’re not to small to make a difference. This series of conversations in Oamaru was prompted by discussions with Phoebe Eden-Mann following her OU Geography field trip to explore Oamaru as a transition town. We are very grateful to the helpful folks from 45 South Television for the use of their studio.